Today was the last sail of this trip. The first leg of the journey home was for Aimee and I to sail Aurora to Furusund, ready for haul out and the drive home. We decided to use this sunny morning to get some good pictures of the four of us in Aurora. After three weeks in the archipelago, with Trev and I both keen photographers, we had still not achieved this. I gave Trev my camera, and with Stefan driving the power boat, he took some fantastic pictures. The breeze was light but Aimee filled all three sails nicely. I’m very pleased with the results; thanks Trev! power boat, Aimee and I sailed on, round the East of Svartlöga through the winding course of bouys which leads through the “minefield”. In the bright sun, light breeze and downwind course it was lovely and hot- swimming costume only! It seems compulsory, when we are in the narrowest part of the channel, for a high speed power boat to pass us. Accordingly, as we passed into the channel, I could see the ferry “Sjögull” coming. We knew from last time we passed through this channel that the skipper takes no prisoners and I took the chance to sail in some safe water out pc the channel, as he powered past at about 20kts. 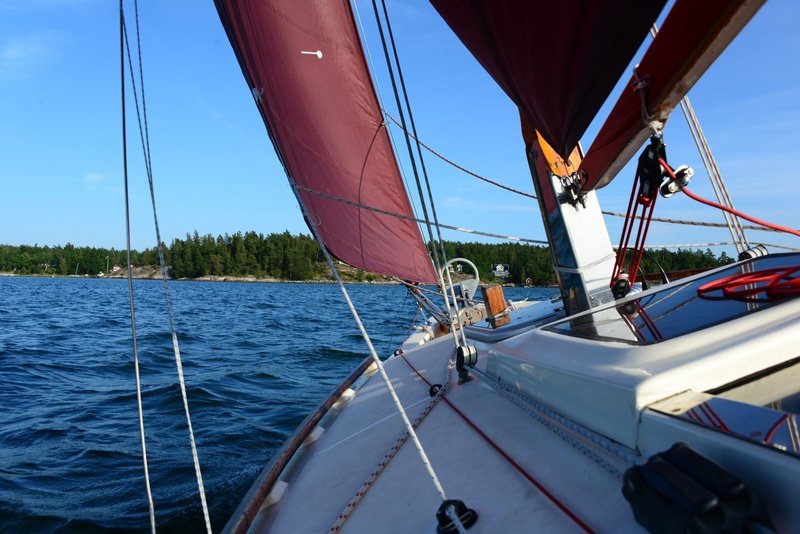 Our course took us dead downwind from Svartlöga to Blidö and we passed close to the shore of pretty Söderöra, an island which we had not managed to visit. 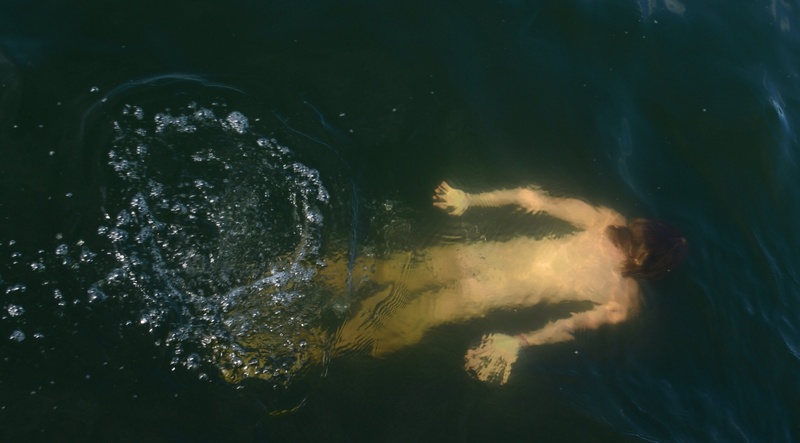 Aimee asked for a swim, so I anchored at Blacke for her. There was a pleasing symmetry to this, a this is where we had anchored for lunch when Aimee and I had made this journey together in reverse at the start of the trip. We did not stop long and were soon on our way again. I took I the sakis and made ready for harbour as we rounded the tip of Yxlan. 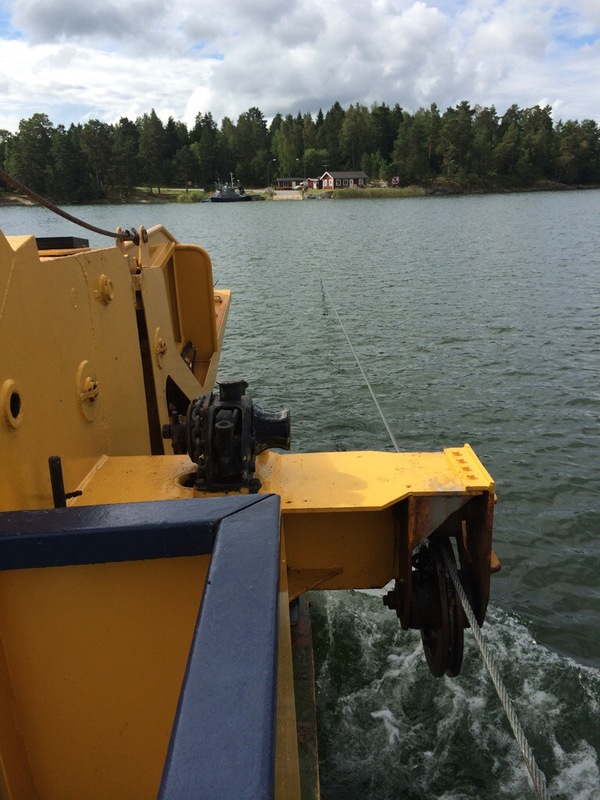 Aimee took us past the car ferry and into Furusunds Gasthamn. 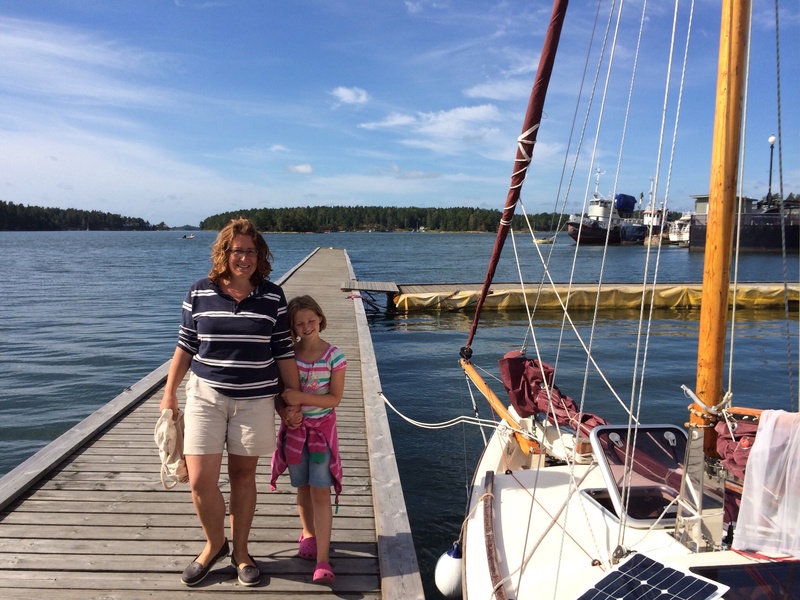 We picked up the stern buoy and Aimee confidently took Auroras nose up to the jetty; I stepped off, made her fast and that was it- the last sail of the trip complete. Furusund was much quieter this week. A week ago, we took the last spot when we visited; today there were only three visiting boats. The staff were very friendly and we secured a discount for being Cruising Association members, even though I had lost the discount card. We enjoyed a lovely ice cream and free wifi and watched the world go by for a bit. Today, I did several things I haven’t done for three weeks- connected to mains electricity, used a flushing toilet and had a shower. 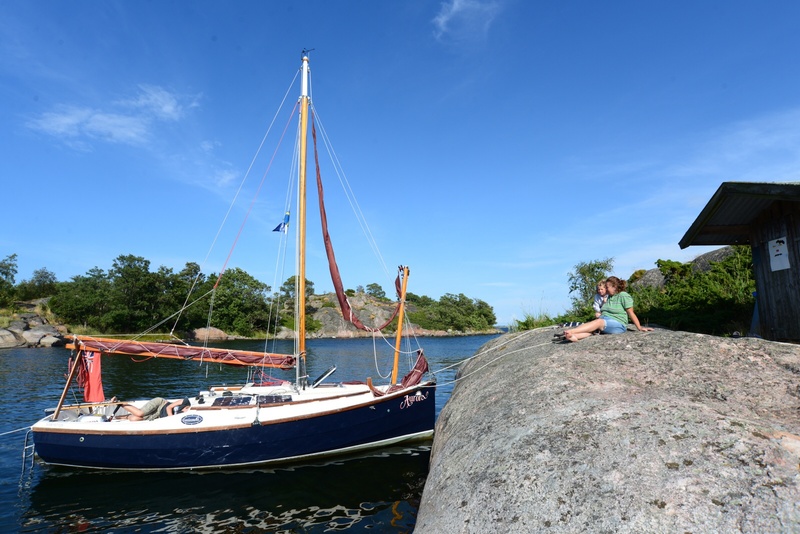 We awoke on our anchorage at Storskär to a morning in complete contrast to the evening before. The water was glassy smooth and there was not a breath of wind. 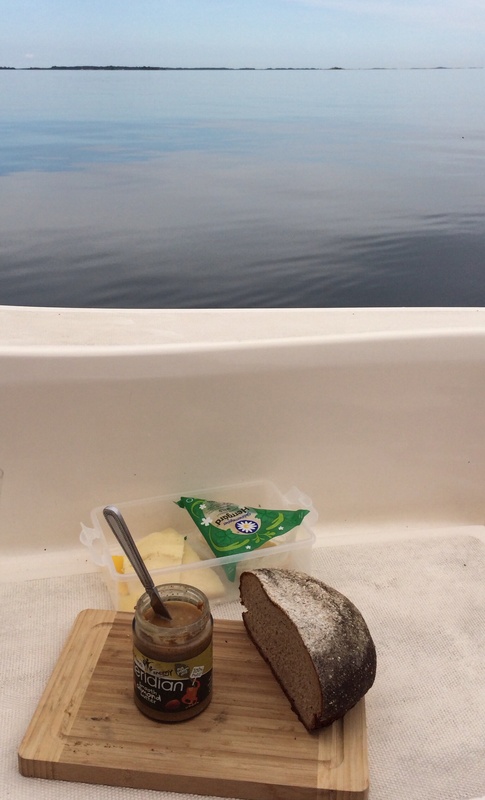 We had a leisurely breakfast of the bread bought on Rödlöga two days previously. This loaf had criticised for its dark colour and heavy texture (Caroline dubbed it “Dwarf Bread”- Terry Pratchett readers will understand this reference). However, it turned out to be really nice, with an almost aniseed flavour. After another walk to the beach of “princess stones” (as Alice dubbed it) there was a ghost of a breeze. 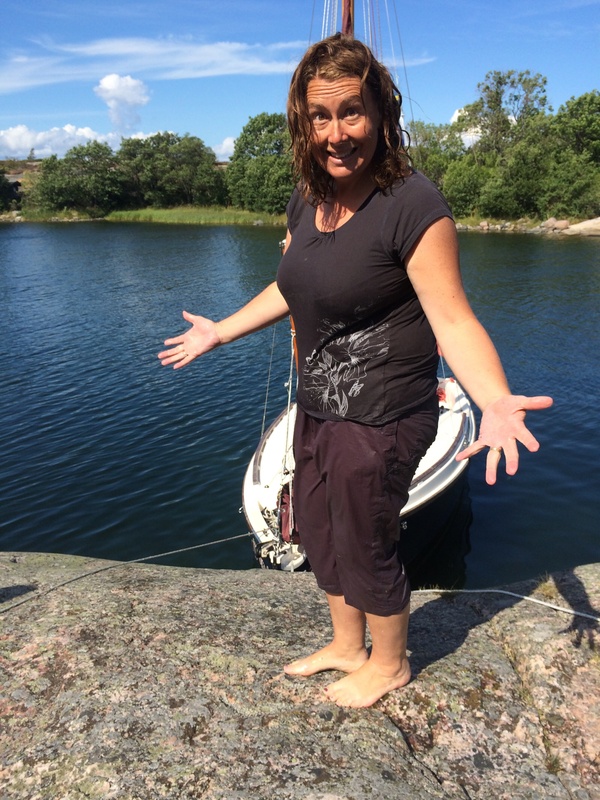 We slipped our warps and set off for Svartlöga. 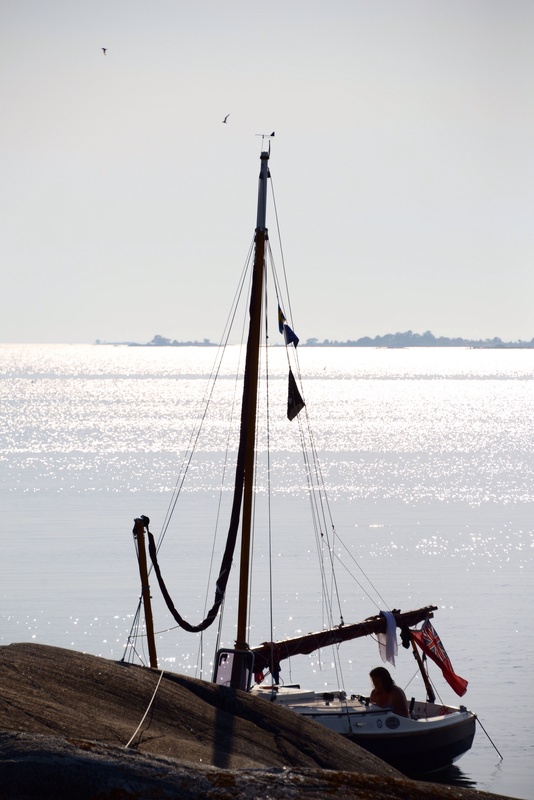 Even though the sea was glassy, there was a faint breeze and being on the beam, we made two knots. There was an eerie quiet over the water; we could hear wavelets lapping on rocks some distance away and people talking on yachts a mile away. Aimee gave Alice a lunchtime cooking lesson and the girls had an eclectic meal of noodles, baked beans and hot dog sausages. Niki and I had more dwarf bread. By this time our breeze had stopped breathing and so the girls opted for a swim. When that was over, there was nothing for it but to fire up Henry Honda and motor the rest of the way back to Svartlöga. 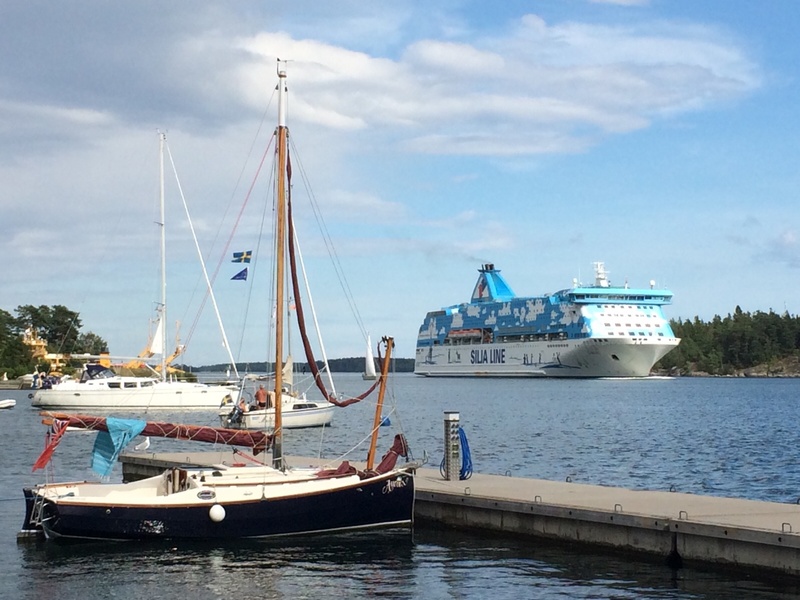 Today we set out on the final family voyage of this Baltic cruise. The wind had dropped from yesterday’s challenging conditions, but was forecast to rise again in the afternoon. Accordingly, we chose a nearby island to visit. One of the few island groups in this part of the archipelago that we had not visited yet was the Rödlöga Skärgård, the group of small islands to the East of Rödlöga itself. The wind was forecast to stay in the south and/or west, so the tiny natural harbour of Lilla Anskäret seemed to be a good target. We covered the 6.5nm in an hour and a half, giving us a spirited sail on mainsail and staysail. We were easily able to weave between the rocks, altering course between a fetch, a reach and a run. We had some excitement as we reached the harbour mouth at speed and rounded up to the wind right over the top of a shallow rock. We were none the wiser until we looked at our track on the gps! When we were moored safely, we had lunch and Alice had a swim (though she could not persuade any of the rest of us to join her). We then explored the island. 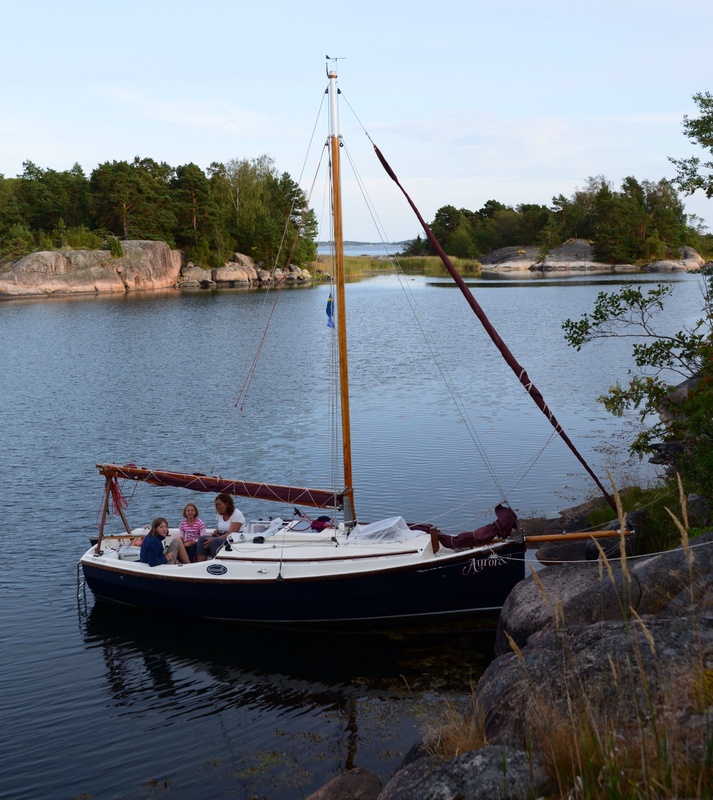 Anskäret has a character of its own with heathland in its centre, though sadly we were anchored on the wrong side of the bay to walk there. We did watch the waves crash on the outer shore, as the wind had risen as forecast. Watching other boats out in the sound, we were glad to be moored securely in the lee of the rock. 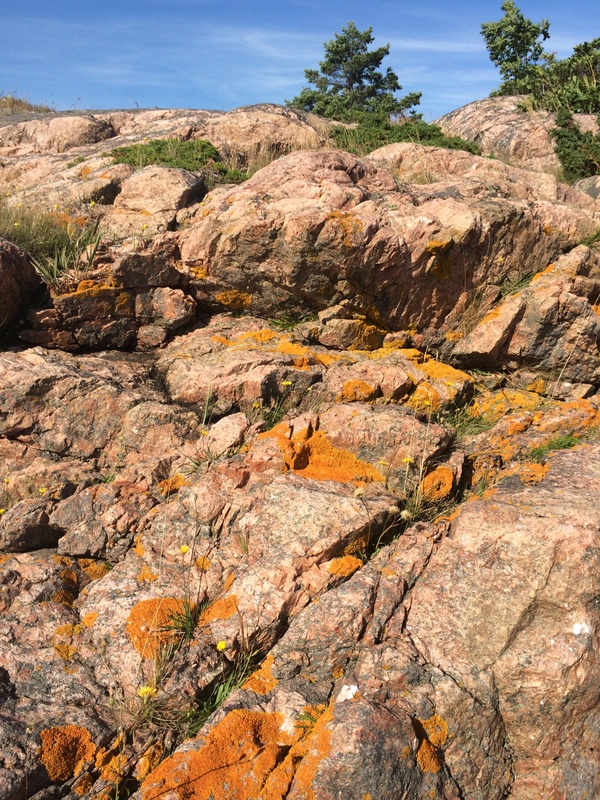 We also observed large bands of pinkish red in the granite bedrock, which gives this island group its name. The rain cover got only its second outing this trip; just after our bracing swim, there were some rumbles of thunder, though the rain did not amount to much. Supplies were needed from the shop on Rödlöga, the neighbouring island and the girls were keen to come (I think it might have been the lure of the ice cream!). They both wanted to have jobs to do, so I suggested they should sail Aurora between them and I would navigate only. It was a fine morning for a sail, but the forecast was for the wind to fill in and get much stronger later. 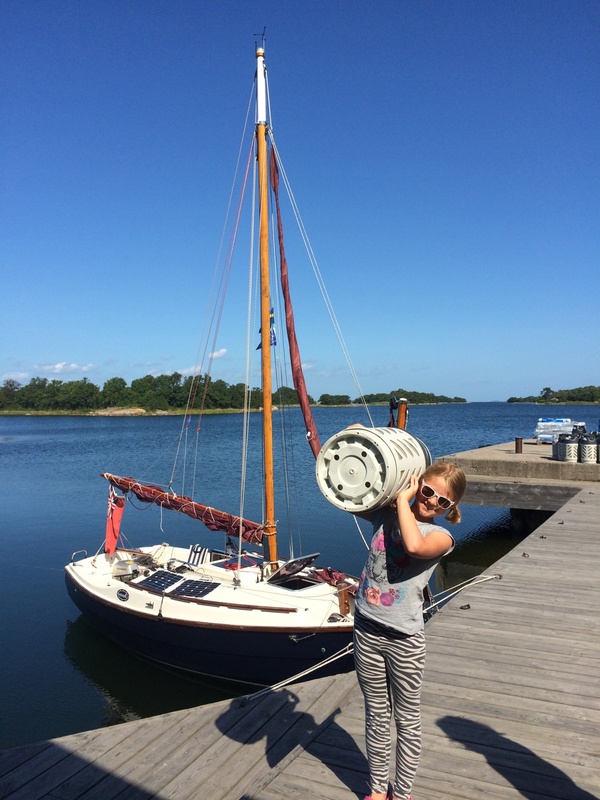 We set off with Aimee at the helm and Alice attending to the sheets; it was a dead run to Rödlöga. Aimee handled the helm with sensitivity and we made good progress, the girls gybing nicely across the sound on main sail and staysail. We entered the harbour through the wide Northern entrance and made a textbook approach to the empty dock, Aimee still at the helm. With the bowsprit up, we were able to bring the bow to within inches of the quay, so stepping off and on Aurora was easy. Stocks in the shop were running down, but the important items were available and the girls were soon enjoying their well-earned ice creams. Having obtained a new gas cylinder for our host’s fridge, some lemons for the G&Ts and a few other fresh provisions, we retired to the cockpit for lunch. The girls asked for a swim, so we moved to the guest buoy in the middle of the harbour, whilst I got things ship shape for the return trip. 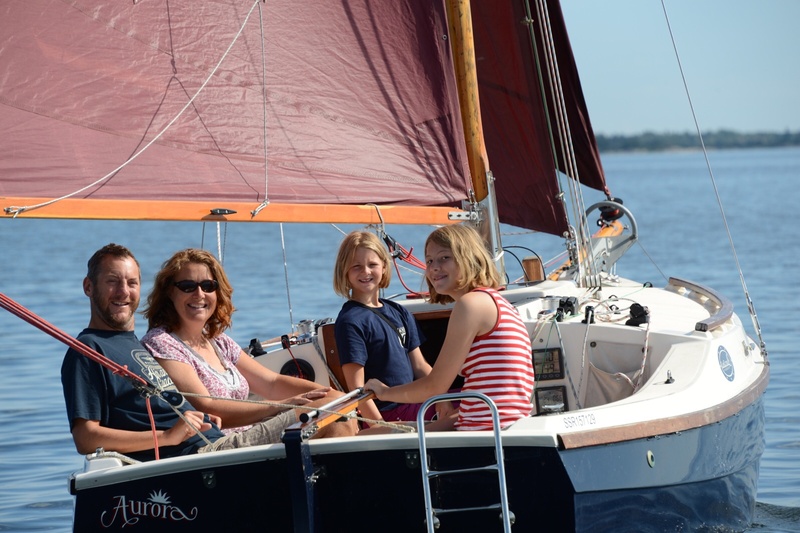 The breeze had stiffened in the time we had been ashore, so I enticed the girls out of the water with a hot chocolate and we motored down the shallow channel, to enter the sound as far south as possible. We found a sheltered spot to raise the reefed main and then poked our nose out to sea. 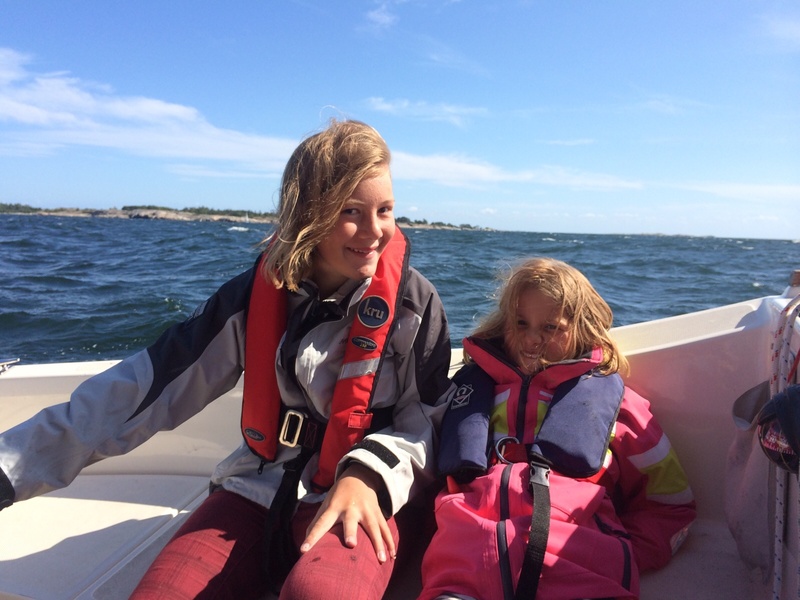 It was indeed quite lively, but Aimee kept good boat speed as we sailed close hauled back to Svartlöga. With the wind in the west, a swell was building, though aurora cut through it confidently. 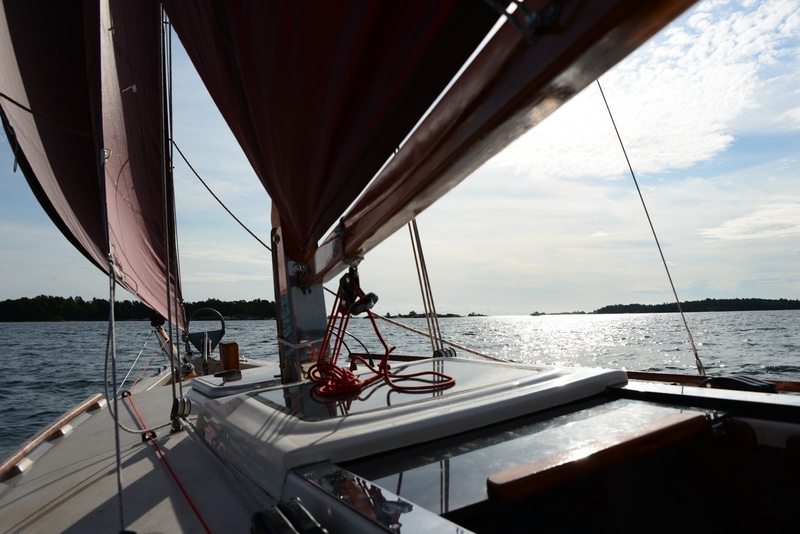 As we progressed toward home, the wind built even more, so I used the outboard to augment the sails. 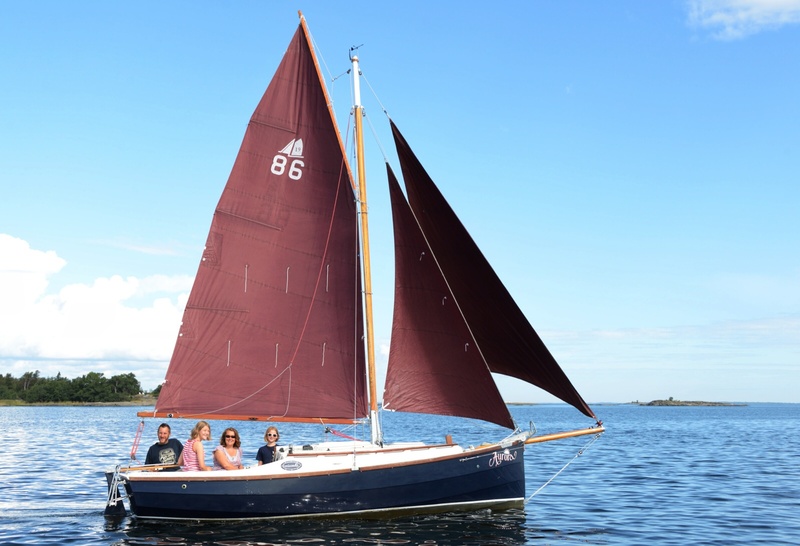 Aimee has invented a new term for this- “smailing”; she is indifferent to the fact that the term motor-sailing already exists! We saved ourselves a few tacks and got ourselves further to windward with the engine and were soon ready to drop sails to enter our little harbour. Aimee confidently wove Aurora between the bouys, which saved me going onto the foredeck while we were in the swell. 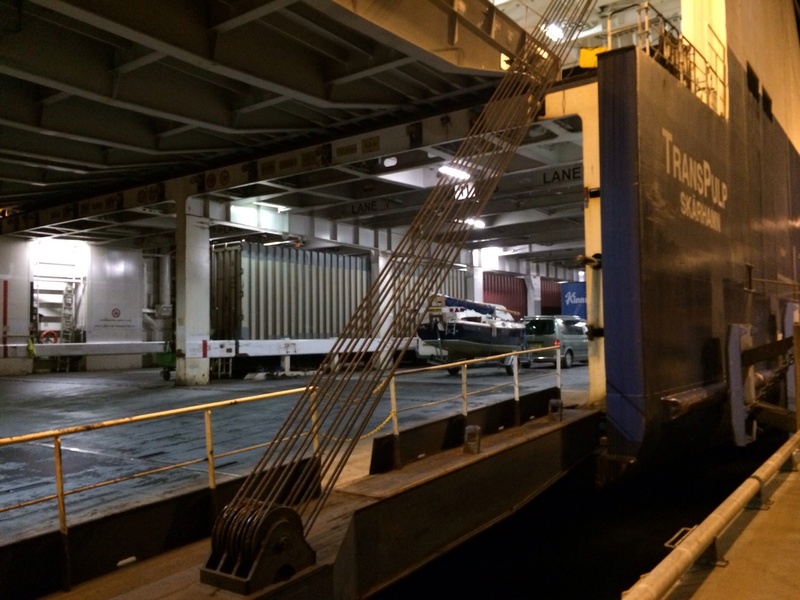 She completed her impressive helming with a smooth sweep onto our berth. 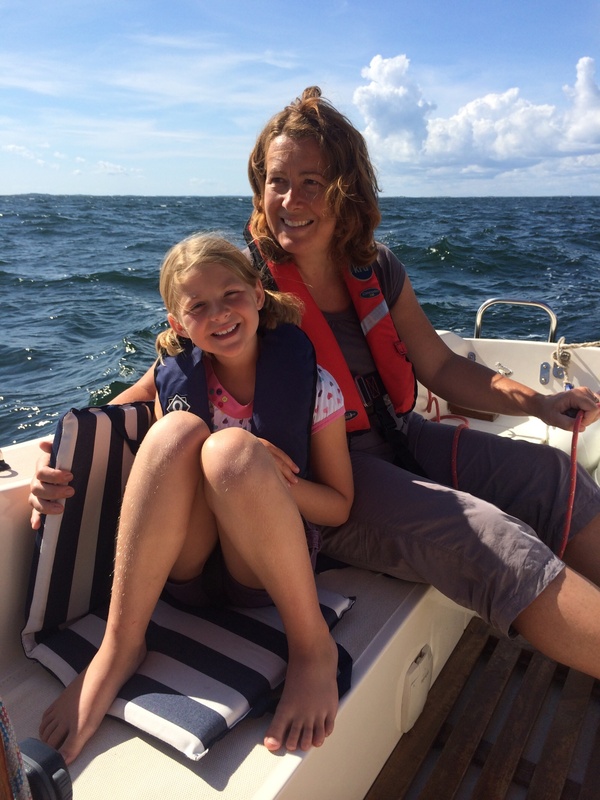 I’m so pleased the girls enjoyed taking control of Aurora and it gives me confidence that Aimee is able to take the helm, even in more challenging conditions. 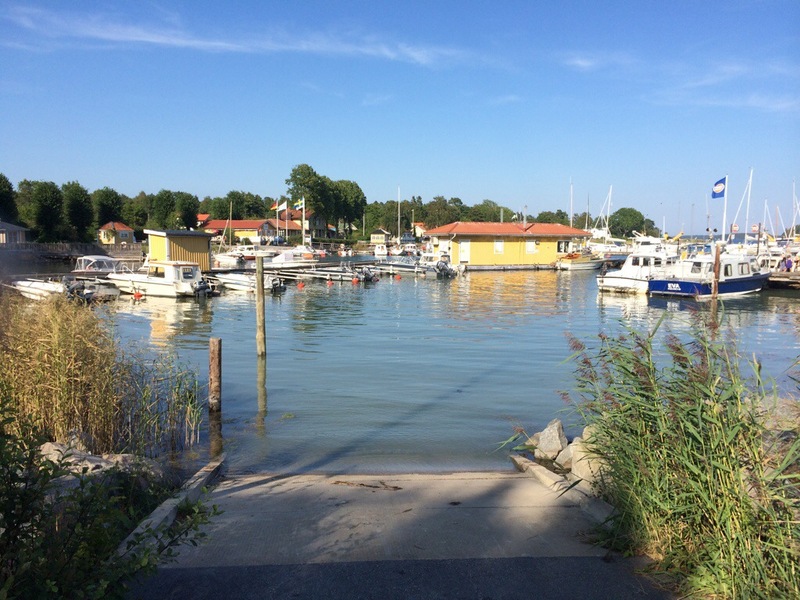 After a noisy night in Högmarsö, to the sound of partying late into the night, we were surprised to find a definite “end of season” feeling, with the bars and shops being boarded up for the winter. The local ICA supermarket was open today for the last day, offering free cinnamon buns and reduced rates to clear the stock. We took on provisions and enjoyed a leisurely cockpit breakfast in the sun. A visiting boat came in and on chatting to the lone occupant, he told me that it had been very windy outside the islands and he had been forced to leave his anchorage rather early. We had been planning to go that way, but changed our plans to sail South down the sound between Yxlan and the mainland. We expected this to be pretty much a reach on the expected westerly, but ended up being a beat. We called into play our dinghy-on-a-reservoir experience, as the wind shifted and bent between the islets. We made quite slow progress, but it was a very pleasant day to be on the water. 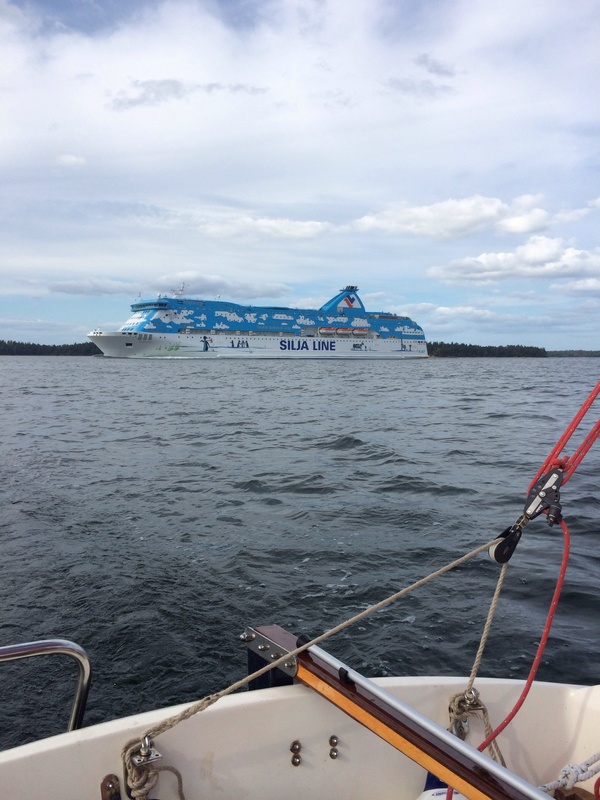 The channel is very deep and is part of the fairway which leads into Stockholm and we saw some interesting traffic, including two huge ferries, which ply the routes between Sweden and the other Baltic countries. The girls had a couple of goes at their new sport- swimming behind the boat. We trail a fender on a long warp and the girls jump off the boat, hang on the rope and swim up and down the boat. It started on one occasion when it was hot and Aurora was nearly becalmed, but now there are frequent requests to stop the boat for a swim. It works best when downwind and the boat can be sailed on staysail only or with scandalised mainsail (lazy jacks up and gaff peak down). 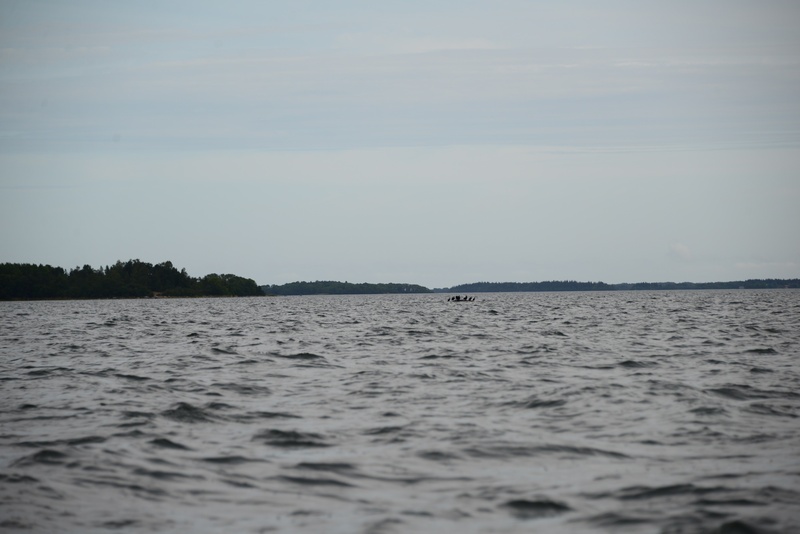 We finally arrived a a tiny sheltered island group called Idskären (literally Carp Islands), most of which is nature reserve with no landing until the end of July. We enjoyed chicken, cooked with tomatoes, onions and herbs, served with bulgur wheat, prepared by Niki in the thermal cooker. Tonight was a full moon (in fact a “super moon”!) and I found a spot where I could see both the setting sun and the rising moon. Sadly, the mon was obscured by cloud, but the sunset was quite spectacular. We have been using the weather forecast on yr.no whilst in the Baltic and have found it to be very accurate. We have had very little rain on this trip, but the forecast was for heavy rain by 11am. Accordingly, we set an alarm for an earlier-than-usual reveille. Despite the forecast, it was a peaceful and sunny morning. I had got up during the night to be greeted by such a peaceful scene- the water was like glass, with the islands reflected almost perfectly in the light of the full moon. Nevertheless, we set off for Svartlöga. The wind was contrary and what had been forecast as a run turned into a spirited beat. We began comfortably on Yankee, staysail and main, but soon were forced to reduce sail to main and staysail. True to the forecast, we could see clouds piling in from the South East a d the wind grew blustery. More or less on the stroke of 11 the first drops of rain fell and soon we were driven by a wind risen from a f2 to a f5 in pouring rain. 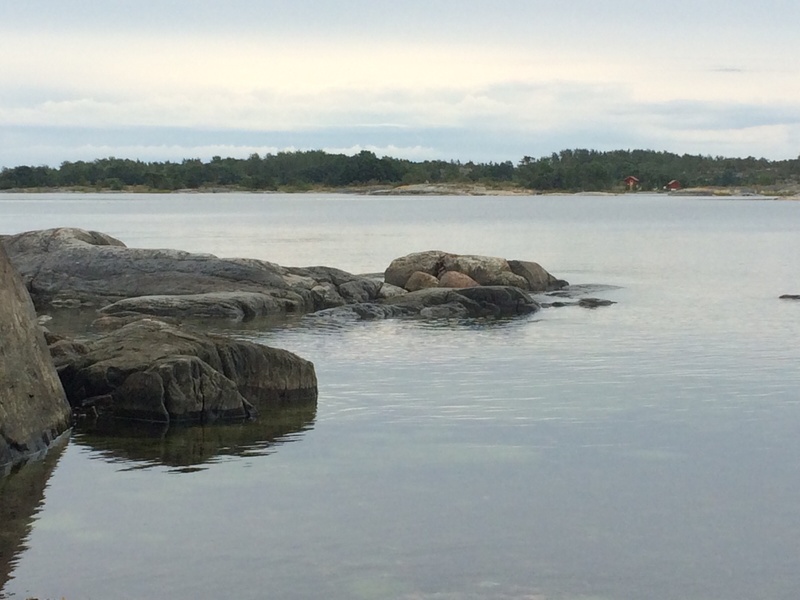 The waters around Svartlöga are quite tricky, with many rocks to negotiate. They can be pretty hard to spot and the Navionics chart is a great reassurance. On one hand, when the weather is calm, they can often be identified by the cluster of cormorants drying their wings (see photo). On the other hand, when the weather is rougher, waves can be seen braking on them. They cannot always be easily seen though and it needs sharp eyes and careful monitoring of chart. 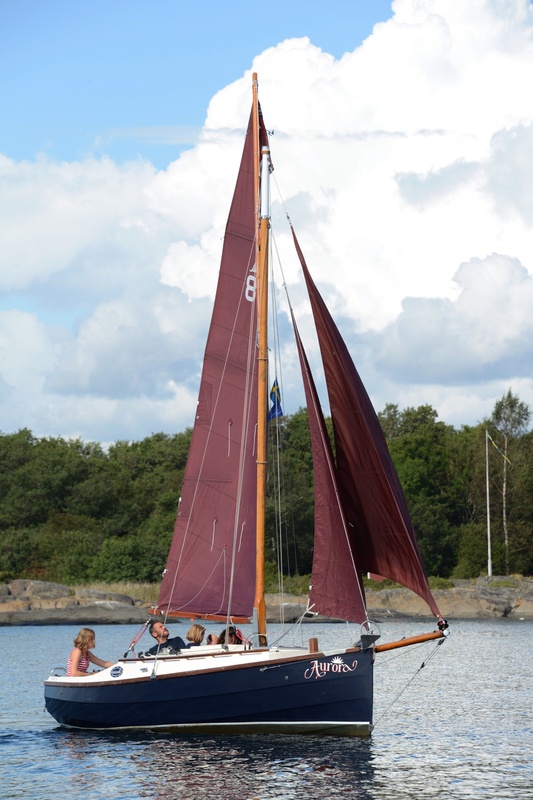 Alice and I were undeterred by the wind and rain and we were soon abeam of the village on Svartlöga. Sails were furled and warps prepared and soon we were welcomed back into harbour by helping hands to dry out whilst the squally weather blew through. 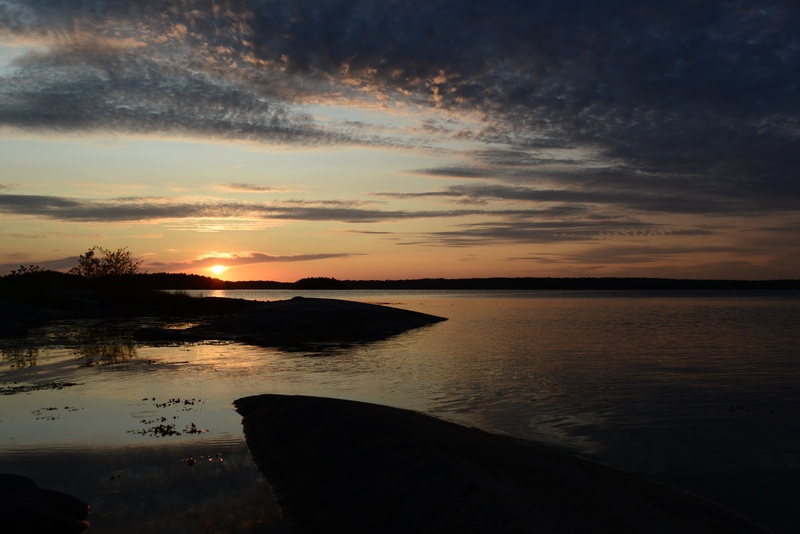 We have now logged more than 200nm on our Baltic cruise and feel that we have had flavour of this part of the archipelago, though I know we have barely scratched the surface. Still, there’s time for at least one more foray before it’s time to haul out….